Grp podium steps for use in sensitive electrical areas such as data centres and telephone exchanges. Also in carrying out high voltage work. The GRP podium steps meet all the health and safety regulations, the steps are suitable for industrial work and certified EN131. Each set has wheels at the rear, a wide working platform of 400mm by 600mm and a special safety chain which fits behind the user offering an enclosed podium for extra safety. Safety chain behind the user to give an enclosed podium. Suitable for industrial work. Certified EN131. Available in 1m and 1.2m platform heights. If you need flexibility while working at exactly the right height for the task in a sensitive area then the hire of GRP podium steps are just the job. But the best thing about Glass Resin Polymer podium steps is that they are specifically designed for use in sensitive areas where high voltage work is carried out such as data centres and telephone exchanges. Working with the GRP podium steps hire will offer you security even in zone one environments while working with electricity and chemicals and because it allows you to adjust your working position, it means that you can be more efficient and improve the quality of your work. While providing a good stable base to work from and offering a full 360 degree enclosure the GRP podium steps from Lakeside-Hire are also fitted with anti-surfing devices which satisfy health and safety professionals. Lakeside-Hire is able to modify all their podium steps at their customer’s request to make them ‘anti-surf’. It is simply a case of adding two base plates to two of the four wheels which means the podium steps are still easy to manoeuvre but stable while a contractor is using the equipment. Safer than a ladder and so much easier to put up than a scaffold tower, the GRP podium steps are the perfect solution for those small jobs at height. 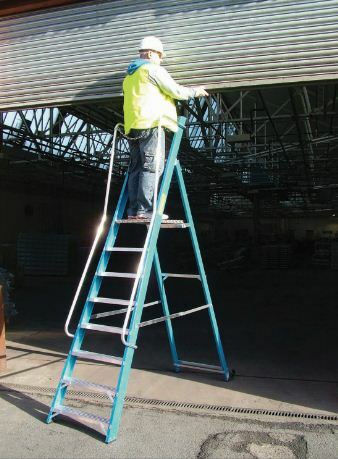 New regulations from safety experts state that contractors should adopt the right position or posture while working at height so it is essential to make sure you always select the Size podium steps for the job. Contact a member of our PASMA trained team to get the best advice before you hire.